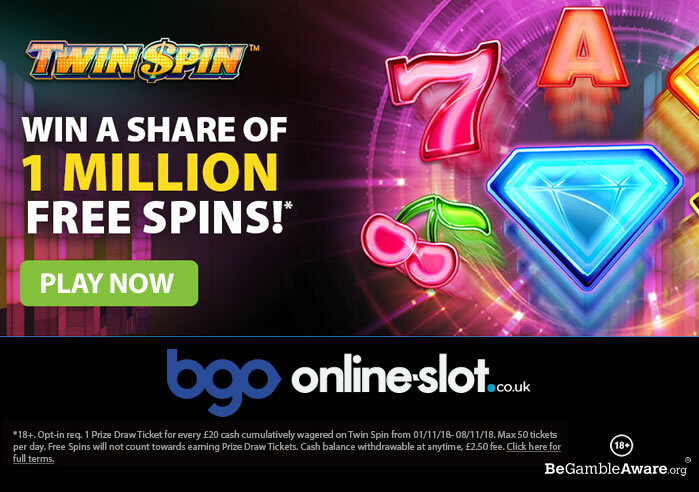 It’s been 5 years since Net Entertainment released the popular Twin Spin slot and they have teamed up with bgo Casino to give away a total of 1 million free spins – yes, 1 million! Twin Spin is a 5 reel, 243 ways to win slot that can be played from 25p a spin across all devices. With a futuristic fruit machine feel, it comes with a Twin Reel feature where 2 reels showcase identical symbols – this can randomly expand to show the same symbols on all 5 reels. This can lead to payouts of 1,080 times your total stake on every single spin. The Twin Spin 5th Anniversary promotion runs until the Thursday the 8th of November (2018) and is simple to enter – firstly, you need to opt in via the ‘Promotions’ section at bgo Casino. Then you need to play Twin Spin with 1 prize draw ticket earned for every £20 you wager. There’s up to 50 tickets to be earned every day. Once the promotion has ended, 20,000 lucky players will be randomly selected to win an equal share of 1 million free spins – that means you’ll get 50 free spins on Twin Spin if you’re a winner. The free spins come with no wagering requirements meaning what you win from them is yours to cashout. Not played at bgo Casino? bgo Casino have over 600 slots from the likes or NetEnt, Bally, WMS, NextGen Gaming, Blueprint Gaming, Barcrest, iSoftBet, Quickspin, IGT and many others. They also have a huge range of Playtech titles including new games like Baam Boom and Suicide Squad. I also recommend the movie inspired The Goonies by Blueprint Gaming. Sign up now to get 10 no deposit free spins on a selection of Blueprint Gaming slots – then deposit to get 2 free spins for every £1 you deposit. If you were to deposit £50, you would get 100 free spins. Remember, all free spins come with no wagering requirements.